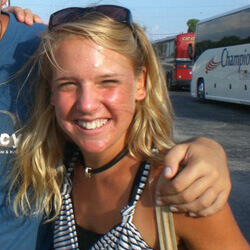 Emily Schlueter, 19 Bowling Green State University Glassmen Mellophone, 2008-2010 How did you choose your corps? I chose the Glassmen for two reasons. The first is that this corps was relatively close to home. The second was that from the first time I saw them in 2007, I had great respect for them. I didn't know much about Drum Corps International prior to marching, but the Glassmen organization seemed very professional and a good place to go to give this activity a shot. What was the experience like the first time you auditioned for a corps? I was 15 when I went to my first audition camp. The most vivid thing I remember is the first time I played in the full horn arc. I was coming from a high school band of about 40 members, so stepping into a gym and playing with well over 100 brass musicians was magical. I'll never forget that sound. What's the best way to prepare for an audition? Practice performing the audition music, marching, or work in front of people. Playing alone in front of others isn't easy. The more comfortable you can make yourself at doing it, the better you'll feel going into your audition. Ask your friends, your band director, or even your dog to sit and listen to you perform. I've found that the family enjoys a little concert after they're all stuffed with turkey on that Thursday before the first audition camp. Very convenient… What would you say to someone who is unsure whether or not to audition for a drum corps? Give it a shot! The worst that can happen is that you receive some great instruction, make some new friends, and get a little taste of how this activity operates. Even if you have no intention of marching, it's a really cool experience to come for a weekend and see what it's all about. Any other advice? When you show up at an audition camp, come open-minded. You will almost definitely be asked to attempt things far different from what you were taught in high school or college from both a visual and musical standpoint. Be flexible, stay positive and have fun! Learn more about corps audition dates, locations and additional info.